There are few things we like more than awesomely creative uses of existing technology. The Fine Bros over at YouTube have created an impressive, interactive Choose-Your-Own-Adventure game using YouTube's in-video linking system. 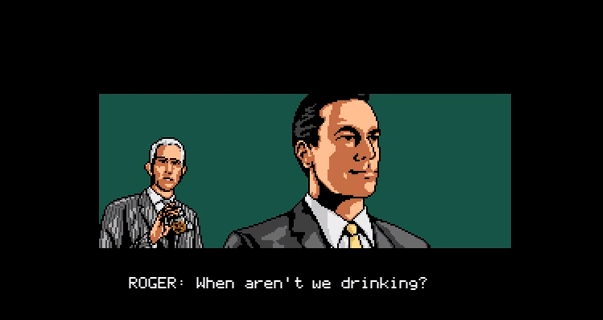 It's called "Mad Men: The Game," and it features retro-console style graphics, an 8-bit soundtrack, and, of course, all the sass and intrigue native to both Mad Men and text-based adventure games. The game's premise is pretty simple: Mad Men star Don Draper has to save the company by refreshing his depleted stats -- confidence, new ideas, and inner peace. The game has three endings, depending on what order Draper (you) decide to complete tasks. The game uses YouTube's in-video linking system to link to private videos that take you through the storyline. Mad Men: The Game looks and plays great. It's well done, fairly long for an interactive YouTube game, and full of self-aware character snark and nods to the show. Check it out! And if you want more Choose-Your-Own-Adventure fun on YouTube, have a look at The Dark Room.